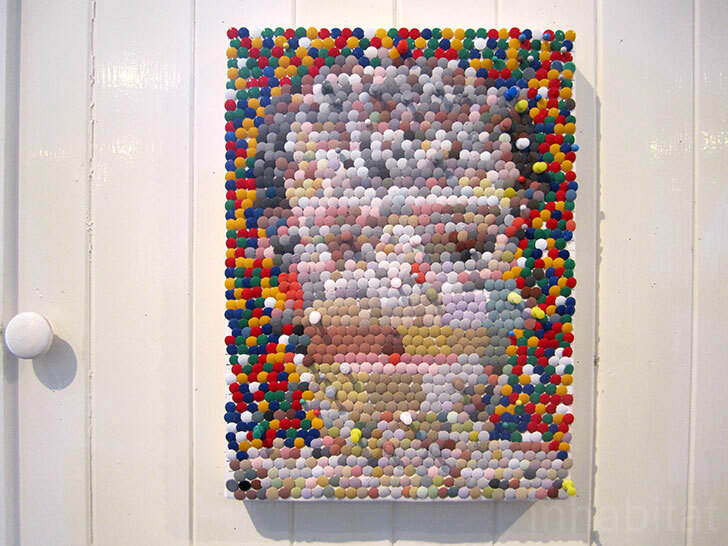 Artist Duncan MacAskill Creates Painterly Portraits From Thousands of Thumbtacks! Scottish artist <a href="http://www.duncanmacaskill.com/">Duncan MacAskill</a>'s work encompasses many mediums, including sculpture, performance and sound - but one in particular is better associated with the office supply store than the gallery: <a href="https://inhabitat.com/how-to-recycle-a-cardboard-box-into-a-diy-earring-holder/" title="How To: Recycle a Cardboard Box Into a DIY Earring Holder">thumbtacks</a>! 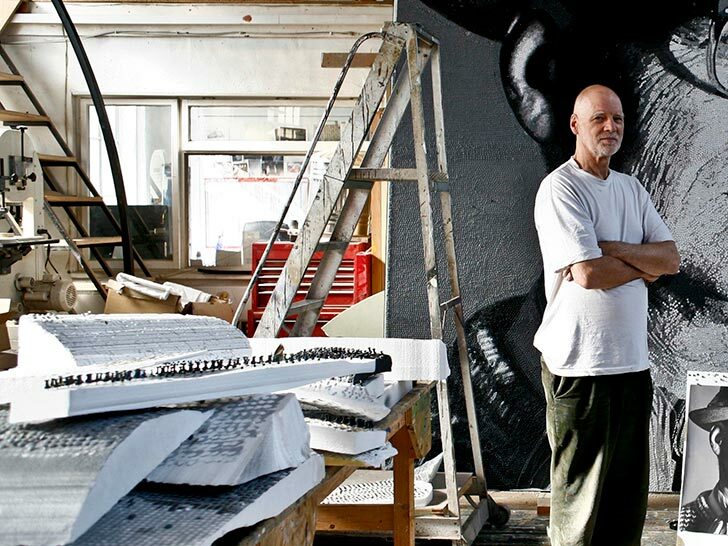 A recent show at The Royal Opera House, commissioned as part of Deloitte Ignite 2011, included a large scale black-and-white <a href="http://www.artsadmin.co.uk/events/3012">portrait of the artist's father</a>, created with more than 25,000 thumbtacks. For the <a href="https://inhabitat.com/london-design-week/">2012 London Design Festival</a>, fashion accessories designer <a href="http://www.allycapellino.co.uk/">Ally Capellino</a> commissioned MacAskill to show a series of small works in her East London shop - read on for a first look with our original photographs! 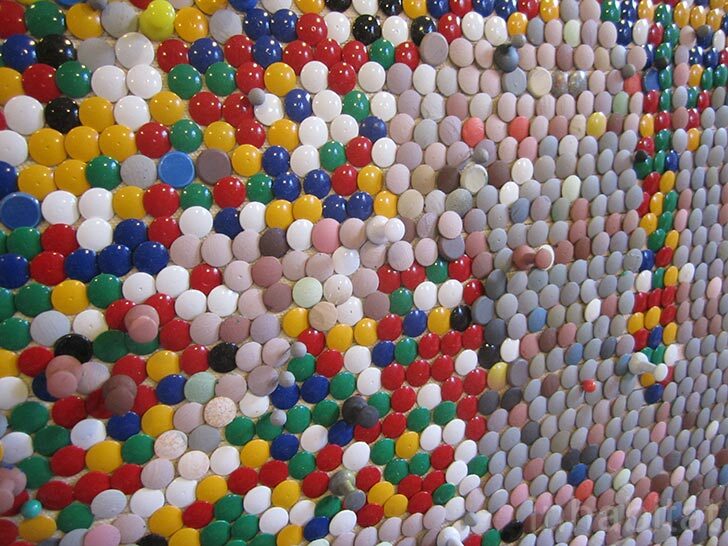 Thumbtacks and push pins, some painted and some left as-is, form beautiful mosaics in artist Duncan MacAskill's work. 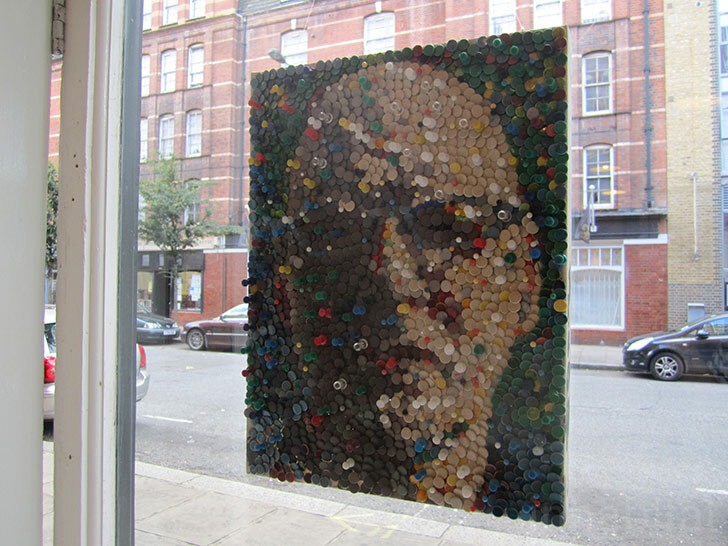 A self-portrait of artist Duncan MacAskill, made of thumbtacks and push pins, hangs in Ally Capellino's East London shop. For a show at the Royal Opera House, Duncan MacAskill made an enormous portrait of his father, using over 25,000 thumbtacks. Ally Capellino has been making leather bags and fashion accessories in London for over 20 years, sharing artist Duncan MacAskill's appreciation for humble materials. She commissioned a series of small works for London Design Festival 2012. 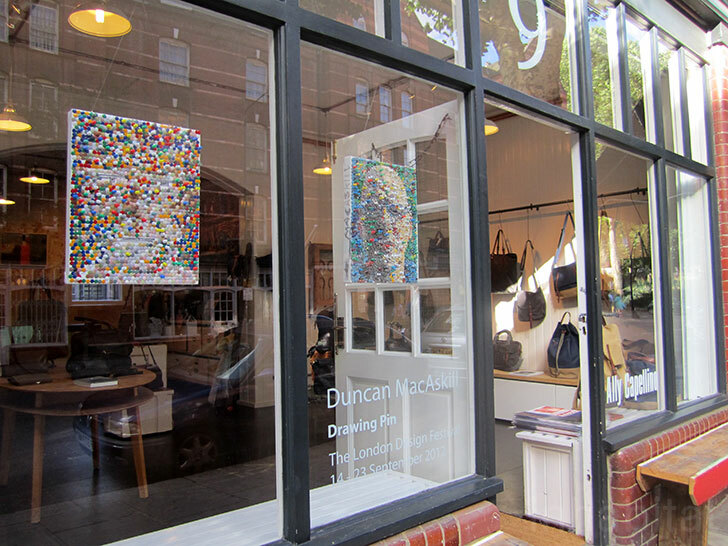 An abstract painting by Scottish artist Duncan MacAskill graces the back wall at Ally Capellino's East London shop. 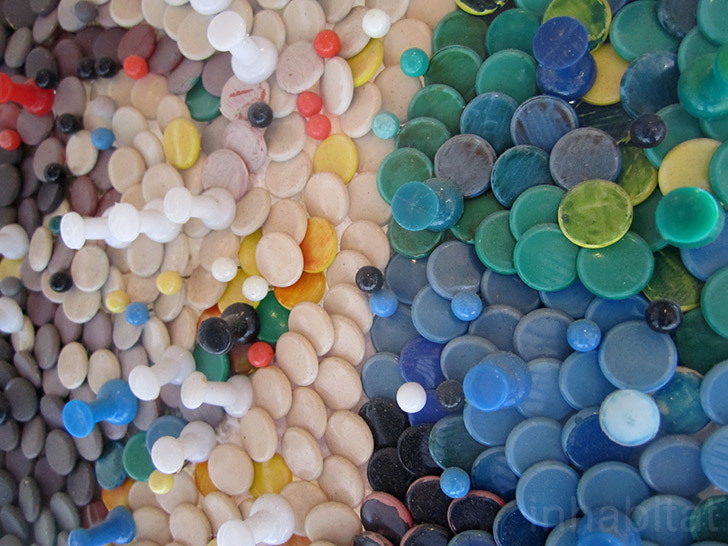 Some of the thumbtacks are spray-painted, others are colored by hand, and others are left bare, for a variety of finishes. Now based in London, artist Duncan MacAskill studied drawing and painting at the Glasgow School of Art. 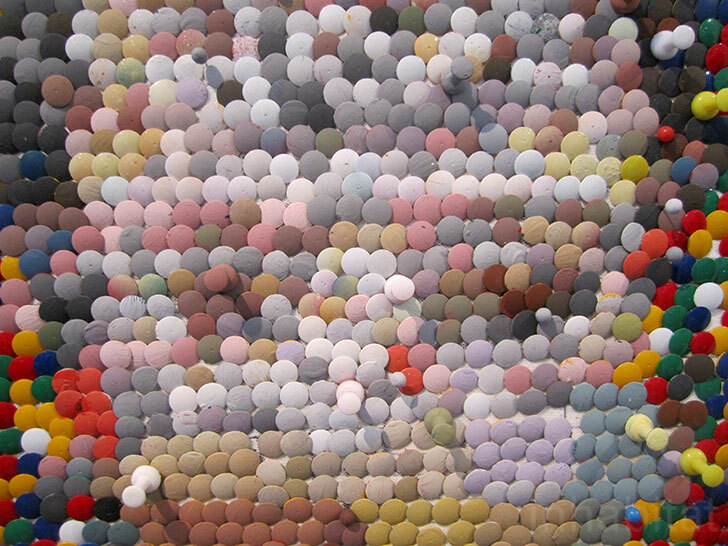 A riotous collection of thumbtacks and push pins make for a colorful abstract mosaic in artist Duncan MacAskill's work. 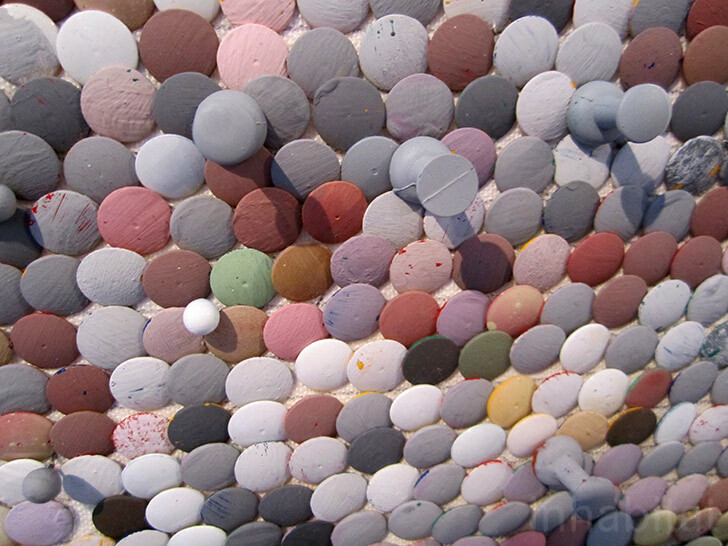 Map pins and spray-painted thumbtacks make artist Duncan MacAskill's pieces particularly textural. 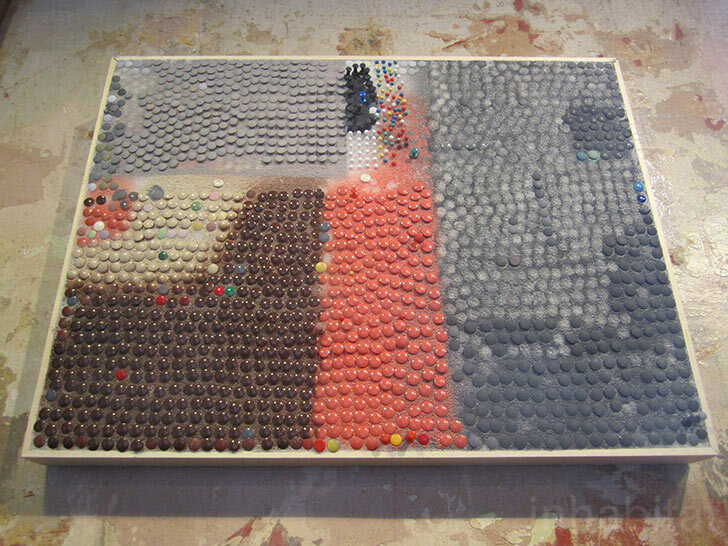 When he's not making portraits with push pins and thumbtacks, artist Duncan MacAskill also works in sculpture, performance, sound and dance. Another of artist Duncan MacAskill's projects is a postcard series -- for more than 20 years, he's been sending a postcard a day, each an individual artwork, either to himself or others. What's usually referred to as a thumbtack in America is called a drawing pin in England. 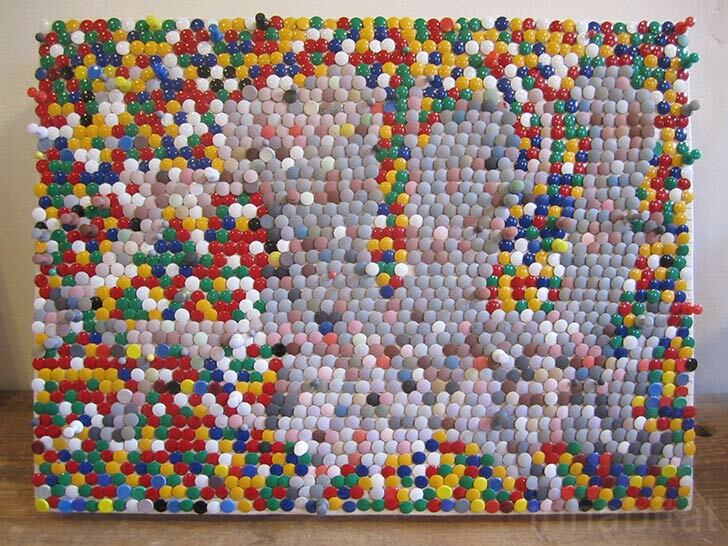 Scottish artist Duncan MacAskill's work encompasses many mediums, including sculpture, performance and sound - but one in particular is better associated with the office supply store than the gallery: thumbtacks! 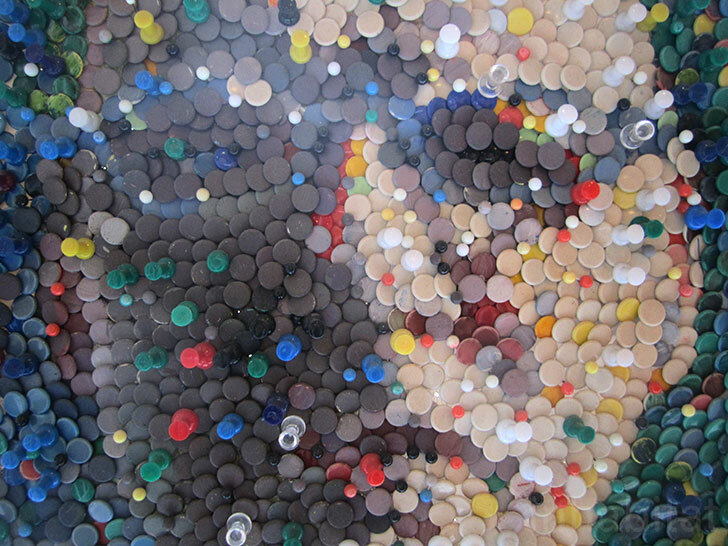 A recent show at The Royal Opera House, commissioned as part of Deloitte Ignite 2011, included a large scale black-and-white portrait of the artist's father, created with more than 25,000 thumbtacks. For the 2012 London Design Festival, fashion accessories designer Ally Capellino commissioned MacAskill to show a series of small works in her East London shop - read on for a first look with our original photographs!